In kindergarten and first grade classrooms, parents are often handed a list of sight words to be learned by the end of a particular grading period. Although you may smile nicely at the teacher, you may be groaning internally at the thought of mastering all of those words with your child. 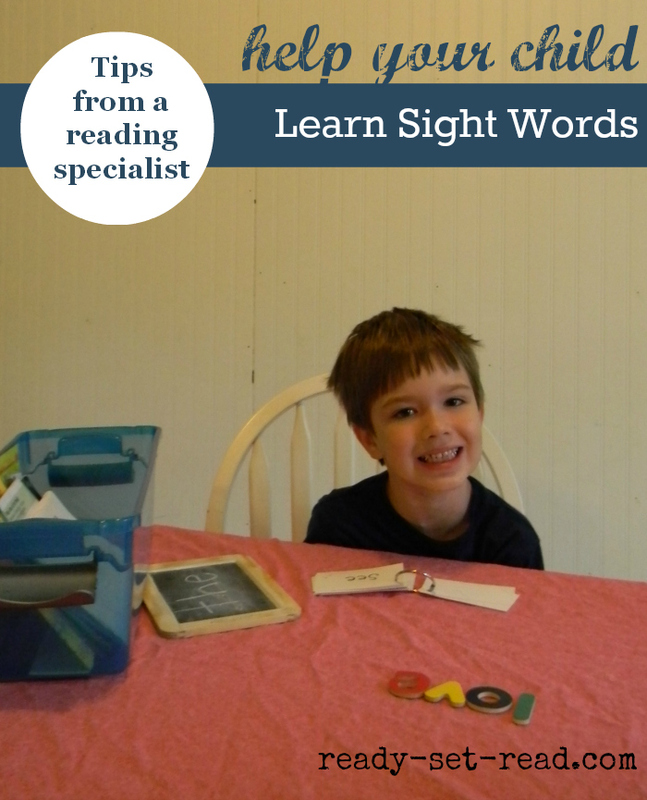 Learning sight words doesn't have to be a difficult chore. If parents and teachers work together, sight words can be mastered in 5 easy steps. Sight words are the most commonly used words in the English language. In fact, approximately half the words you encounter in day-to-day reading are sight words. Sight words can help a child build fluency in reading. Sight words can be easily learned by using repetition, introducing sight words using books, connecting sight words to writing, keeping the learning hands on, and celebrating when words are known. 1. Provide opportunities for repetition when learning sight words. 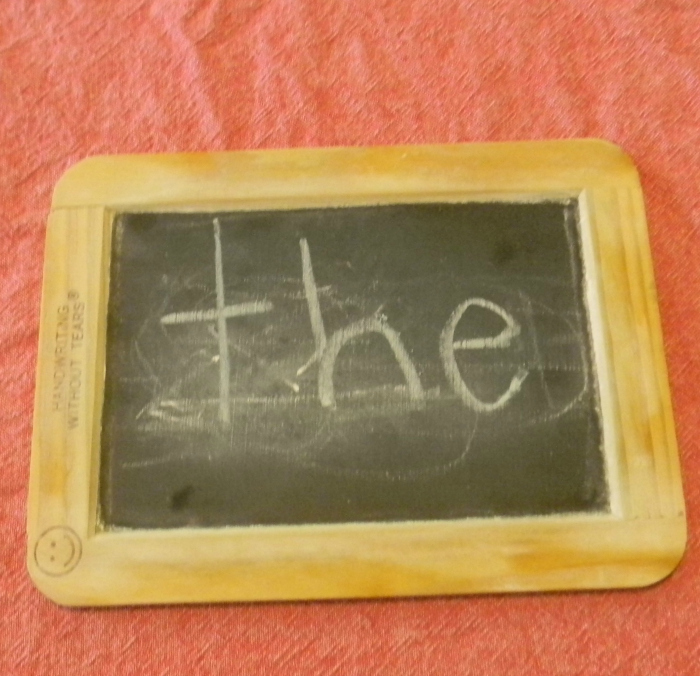 Provide a collection of sight words for your child to re-read. You can simply write the words on index cards and put on a ring clip. Children can re read the words each day. Have your child work for a quick visual recognition of the words. Start by collecting the words your child knows and introduce one or two new words at a time. 2. Introduce new sight words in the context of continuous text. Sight word tests often ask children to read a list of words. It is also important that children can recognize sight words when they appear in books. Offer your child books with simple repetitive text that use a few key sight words. You can make your own books with texts like, "I can jump. I can run. I can walk." 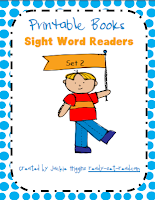 You can also purchase sight word reader sets from my teachers pay teacher store. 3. Practice sight words in writing as well as reading. We often think of reading sight words, but writing sight words can be very effective in learning. When a child writes a word, he/she slows down the process and is forced to look closely at every letter in the word. 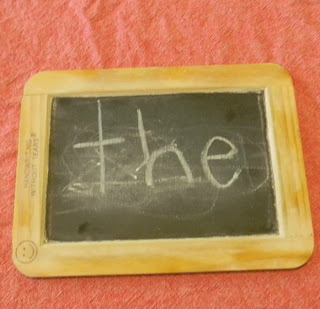 When your child is writing and comes to a sight word he/she knows, expect him/her to spell that word correctly. If your child needs help, practice the word on a white board or chalk board first. Have your child write the word. Challenge your child to write it again and do it more quickly. Then challenge your child to erase it and write it without looking at a copy. If your child can write a sight word quickly and accurately, it probably means he/she has very good control of the word. 4. Learn sight words in fun and hands on ways. There are so many fun ways to learn sight words. You can write them in different colors. You can sing songs to learn sight words. You can play games like twister or hopscotch and insert your sight words. 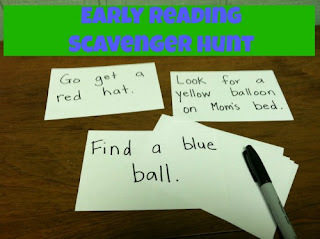 You can use sight words to solve clues in a scavenger hunt. 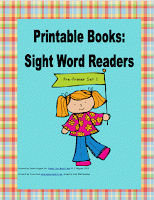 I've collected tons of hands on learning on my learn to read: sight words Pinterest board. I'd love if you'd check it out and follow. I'll be pinning more great sight word ideas all year as my son works to learn his kindergarten sight words. 5. Celebrate the sight words your child can read independently. Create a display in your house of sight words your child knows. A train theme or caterpillar theme can be great for adding on new words. Challenge your child to see how long the caterpillar or train will be when all the words are added. Another sight word display could be created with popcorn. Teachers often call sight words "popcorn words" because they pop up so frequently in reading. 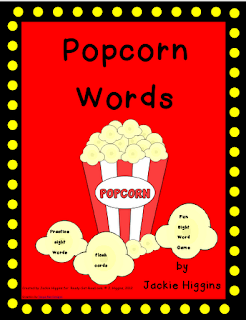 I have a free printable popcorn words that you may want to download and use. 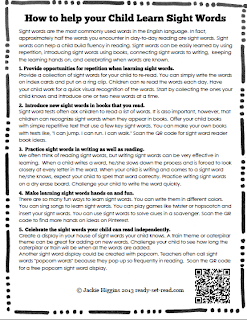 If you found the ideas in this post helpful and would like to share them with parents, I have provided a one page handout giving some of the basic information about sight words. This would be a great handout to provide to parents at open house to provide back to school ideas. There is a QR code provided on the handout. Parents seeking additional information can scan the code and find this blog post. Click to get your free printable on google drive. These are some really great ideas for new readers! Thanks a bunch for linking up to the Kid Blogger Network Back-to-School blog hop!